Bubbles, Bubbles and MORE Bubbles! A bubble might be a mere puff of air trapped inside a soap and water film, but there is much, much more to explore! 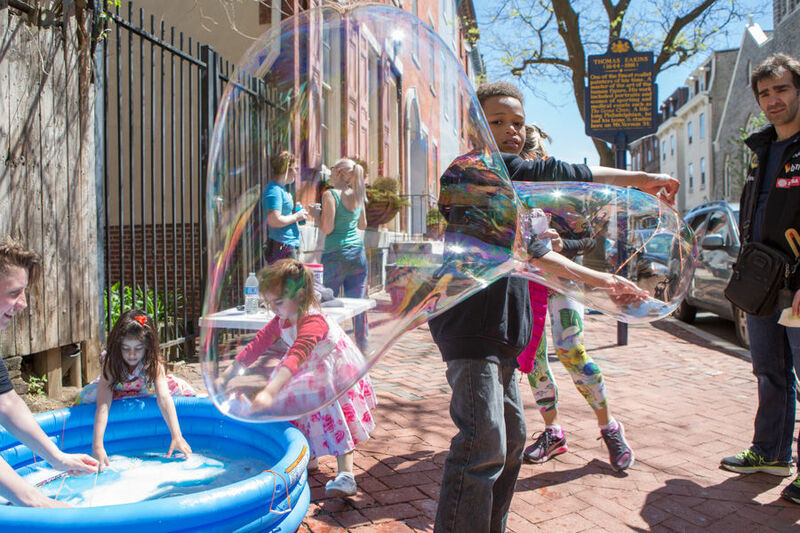 The magic of bubble artistry comes to life in this family-friendly event designed to celebrate the infinite ways these momentary soap masterpieces captivate and delight. Create glistening bubble watercolor art. Bounce, catch and chase bubbles. Blow bubbles using a variety of tools. Mix bubble formula. And, for the ultimate bubble lover—step inside a giant hula-hoop formed bubble! Plus, create vibrant art that represents you and your community with a stop at Murals on the Move, a colorful van stocked with art supplies and equipped with talented teaching artists from the Mural Arts Philadelphia. POP on by for BUBBLES of FUN! This event is a part of the Philadelphia Science Festival, hosted by Mural Arts and the Friends of the Rail Park.